Average car wash uses metal tokens, magnetic keys or coins for its services. A wide array of companies are directly or indirectly incorporating new smartphone applications and hence continually enhancing their features to wholly new levels. New car wash business model with Ready2Wash smartphone app can completely replace metal tokens and magnetic keys with virtual tokens. With virtual tokens, car wash owners reduce costs for the purchase of metal tokens and magnetic keys, prevent waste of resources that arise when users lose metal tokens and reduce the possibility of abuse (copying and reselling). Global virtual tokens – can be used on any car wash in Ready2Wash system. Local virtual tokens – can be used only on specific car wash. Various payment methods (cash or cashless) are available. Credit card payment is secured to the highest safety standards. We use a special process of identifying users, 3D Secure (Verified by Visa and MasterCard Secure Code) system, which provides additional protection. The end user can buy virtual tokens on R2W kiosk, R2W smartphone app or by request. The end user can spend virtual tokens as same as the real ones. Inserted virtual tokens to smartphone applications are also displayed on the mobile screen and screen in a box for washing. Global Virtual R2W tokens can be used on any car wash in R2W network. There is only one type of global virtual token, R2W tokens. 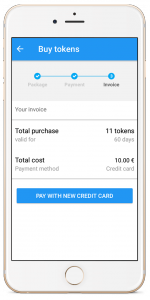 The user buys the virtual tokens through an application for smartphones, using one of the available methods of cashless payment. Legal entities can buy these tokens by the request to the company Ready2Wash s.r.o. For each state there is special price of global virtual tokens, depending on the price list established for that specific country. Local virtual tokens may be used at only certain car wash in the Ready2Wash network. Each car wash may have its own virtual tokens. End users can purchase local virtual tokens on the change machine (with R2H module) or by the request addressed to the car wash. In this case, the customer pays a virtual token to the car wash where he is located, receives virtual tokens to his R2W account and uses them for services (on that car wash).